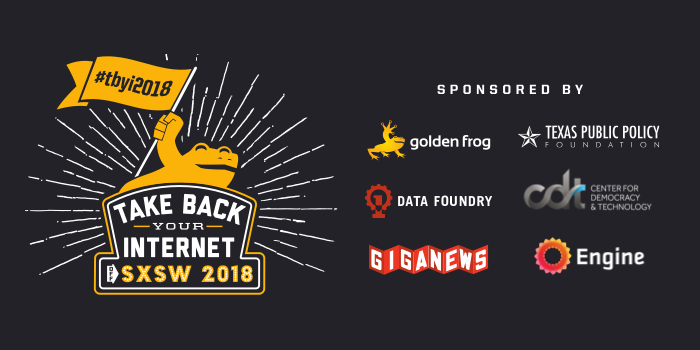 Giganews is back at SXSW hosting Take Back Your Internet with Golden Frog. Back in 2016, Golden Frog and Giganews discussed governments wanting to backdoor into encrypted communications. This year, the Texas Public Policy Foundation is joining us in hosting our Take Back Your Internet event. Where we will be discussing the current state of the Internet around the world. What is next after net neutrality? The FCC recently voted to repeal net neutrality guidelines and was met with extreme pushback from the public. Now that net neutrality provisions are officially gone, it's time to look forward and find a new solution to ensure that Internet users in the United States have access to an open Internet, without restrictions on their speed or access imposed by broadband providers. Golden Frog believes open access is the best solution! What can we do about the decline of Internet freedoms worldwide? This year's Freedom on the Net revealed the alarming fact that Internet freedoms continue to decline worldwide for the 7th year in a row. As more countries filter and censor the Internet and block important tools like Usenet and VPNs, it's imperative we fight back and grant Internet users around the world the Internet freedoms they deserve. Is your personal data your personal property? Who should retain ownership of your personal data? What rules should companies follow when collecting, saving and even selling this information? We'll discuss privacy implications of all the data being shared online, and the concept of personal data as property. This year's event features the following panelists, who will tackle the questions above from unique points of view. Philip drives the technology development and decisions for our products and services, and has over 20 years of experience working with Internet service companies. Philip is responsible for scaling Golden Frog's products and services and designing and implementing new technologies, including VyprVPN's proprietary Chameleon technology. Drew is the Senior Federal Policy Analyst for the Center for Tenth Amendment Action at the Texas Public Policy Foundation. Most recently, he spent two years in the U.S. Senate as Domestic Policy Advisor for Sen. Ted Cruz (R-TX). Prior to that, he worked a variety of issues as a Legislative Strategist at Heritage Action for America. He was a member of the Koch Associate Program, where he helped advance economic freedom and limited government through non-profit engagement with the public. Rachel is currently focused on developing policy priorities and engaging with lawmakers to promote startup interests in Washington. Rachel is a veteran in tech policy, with deep experience in government and the private sector. She recently managed policy advocacy for some of the nation's leading tech companies, and, before that, served as Legal Counsel for Congressman Blake Farenthold. Joseph is the Chief Technologist and Director of the Internet Architecture project at the Center for Democracy & Technology, a Washington, DC-based non-profit advocacy organization dedicated to ensuring the Internet remains open, innovative and free. His work focuses on the intersection of technology, law, and policy, with a goal of ensuring technical considerations are appropriately embedded into legal and policy instruments. Ellen is an accomplished businesswoman and an active member of the Austin, Texas community. She currently represents District 8 on the Austin City Council. In her professional career, she manages a successful residential real estate business and is dedicated to making living in Austin affordable. After graduating with a degree in business from the University of Texas, she began a decade-long career in public policy. In her capacity at the State Capitol, she worked with constituents, local municipalities, state agencies and interest groups in researching and developing effective policy on a vast array of issues. Join Us – RSVP Now! The Texas Public Policy Foundation is a non-profit organization whose mission is to "promote and defend liberty, personal responsibility, and free enterprise in Texas and the nation by educating and affecting policymakers and the Texas public policy debate with academically sound research and outreach."